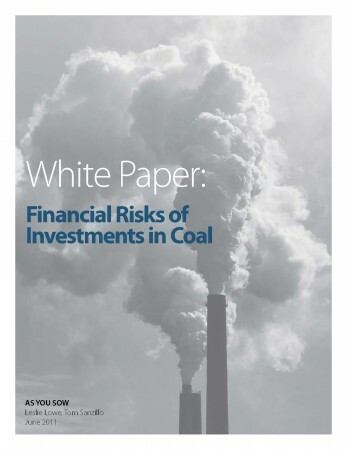 In June 2011, As You Sow released White Paper: Financial Risks of Investments in Coal laying out the financial risks of continued reliance on coal for electricity generation. As You Sow has released an Update to the 2011 White Paper that provides a snapshot of the current trends underlying the financial risks for investments in coal. Access the Update here. The unprecedented level of regulatory uncertainty. Existing regulations are being more strictly enforced as a result of litigation and the change of administration in Washington. New regulations in the pipeline will impart significant, unpredictable individual and cumulative costs on coal-reliant industries. Commodity risk due to volatile and rising coal prices and low natural gas prices. The changing nature of domestic coal markets and the prospect of future increases in the price of coal make its uncertainty as an inexpensive fuel for electricity production a new piece of the energy calculus in the U.S. Abundant supply and rapid price decline of natural gas in the U.S. has driven down power prices nationwide. This market condition is expected to persist for the foreseeable future. Increasing construction costs. Global price increases for construction materials due to new power plant construction in China and India have established a new floor for coal price construction. Domestic regulatory mandates, the age of the nation’s coal fleet, and low power prices are driving decisions to replace the existing fleet of coal plants with other sources of power generation. The clearest signal that the utility industry acknowledges these risks is the cancellation by public utility commissions and utilities of 153 new coal plants.i The plant cancellations amounted to $243 billion in investment decisions being reversed, or disinvested, from coal in the past four years.ii In 2010, a growing list of utility announcements carrying the message of existing coal plant closures and plans for new natural gas plants and alternative energy projects continued the trend. i Sierra Club, “Stopping the Coal Rush,” accessed 6 May 2011, available at: www.sierraclub.org/environmentallaw/coal/plantlist.aspx. iiBased on National Energy Technology Laboratory cost of plant at $2500/kw, average plant size 600 MW: Department of Energy and National Energy Technology Laboratory, “Impact of Cost Escalation on Power System R&D Goals,” National Energy Technology Laboratory, August 2008, p. 9, available at: www.netl.doe.gov/energy-analyses/pubs/Re-baselining%20for%20GPRA%20rev11.pdf.